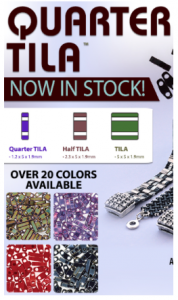 NEW BEADS – Just in! Our last Free Friday class was such a hit — The Fanfare Pendant – we’ve restocked all those great CzechMate beads used in the project. Check out the more than a dozen new colors of quadratiles and triangles! 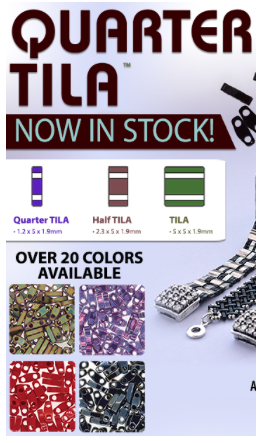 Plus have you seen the new 1/4 Tilas? The Miyuki team was across from our booth at Bead and Button and we watched with delight everyones reaction to this new size tila! It’s now released and guess what? Yep. We have EVERY color! Stop in and check them out!